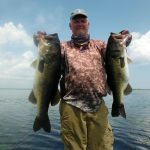 The last couple of weeks here on Lake Okeechobee the weather has been very stable and we have been getting a lot of rain. The water temp is anywhere from 75-82 degrees. The water clarity on the East side of the Lake is muddy (but there are some better fish there). On the north end it is good and the west end of the lake has cleaned up a lot. The best bite right now is with a Swim Jig (white) with a trailer. The Spinnerbait bite is pretty good too. White has been the best for me. The shad are spawning in the Kissimmee grass, after the morning bite is over move inside to the Pencil Reeds and flip them with a Gambler Fat Ace or a Burner worm with a light weight. Also a Gambler Jigzilla has been catching fish too. Good areas are J&S, 3rd Point, Kings Bar, and the Lakeport area of the lake. Here is a picture of a couple of fish that I caught this week.